So if you didn't hear, iOS 7 came out earlier today. But of course you heard. For a while, it seemed like everybody with an iPhone was focused on one thing: updating their phone and staring at a progress bar that inched ever so slowly (if it didn't give you an error, that is) towards iOS 7 Valhalla. It didn't matter what the hell was going on around us, it didn't matter if babies were crying or if lives were at stake or if the world was ending—we just wanted to get to iOS 7. 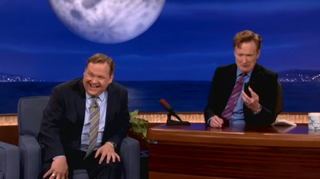 Conan's bit right here explains people's obsession with iOS 7 perfectly (and hilariously).